This text was designed for use in the human osteology laboratory classroom. Bones are described to aid in identification of skeletonized remains. Basic techniques for siding, aging, sexing, and stature estimation are described. Contents: Human skeleton; Table of muscles; Axial skeleton; Superior thoracic aperture; Scalene muscles; Hip flexors; Vesico-uterine pouch; List of bones of the human skeleton; List of homologues of the human reproductive system; Neanderthal anatomy. An interactive visual search tool that allows users to explore the human body in 3-D. Users can search multiple layers of the human anatomy, view systems and organs down to their smallest parts, and understand in detail how the human body works. 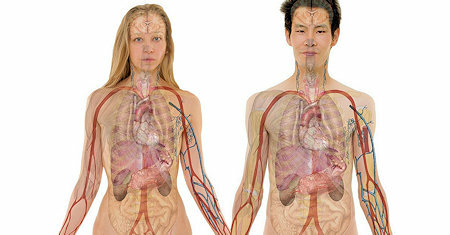 Anatomy and physiology are closely integrated both theoretically and practically. Anatomical information provides clues about probable functions and physiological mechanisms can be explained only in terms of the underlying anatomy. From the table of contents: Neuroimaging Primer; Normal Anatomy in 3-D with MRI/PET; Normal Brain; Cerebrovascular Disease (stroke or 'brain attack'); Neoplastic Disease (brain tumor); Degenerative Disease; Inflammatory or Infectious Disease. The main object of studying anatomy is to obtain a mental image of the human body rather than to memorize numerous terms. Pictures of dissections aid the imagination of the student enormously and thus guide his work from the known to the unknown. As a thoroughly practical treatise on the subject for the medical student, Gray's Anatomy has long been held in the highest esteem. The essentials are here embodied into a complete account of the structures of the human body and their development. It is not the object of this work to teach plain anatomical facts; its aim is to show the relation of structure to function, whether it is normal function or function disturbed or impaired by injury or disease. It is explanatory and utilitarian. A concise and accessible introduction and revision aid to fundamental anatomy for medical and allied health students and sports science students. Following an easy-to-use format, each topic is presented as a double-page spread with key facts. The authors focus on concise descriptions of steps in the dissection process and provide key illustrations. Additionally, students can access a large videodisc image gallery which serves as a guide to the various steps of dissection. Anatomic variations arise from our genetic composition, no two living organisms are functionally or structurally identical. The authors describe normal things, although they may differ from the usual. Useful for quick reference. This atlas was prepared with the student as the foremost consideration. The Atlas' function is classroom-oriented, it supplements textbooks heavily weighted towards electron microscopy, it provides concise structural/functional correlations. This atlas is translated from the original atlas entitled Handbuch der Anatomie des Menschen which was published in 1841 in Leipzig, Germany. The author of this atlas was Professor Dr. Carl Ernest Bock, who lived from 1809 - 1874.